Vinnies provides help to the community in many different ways and volunteers make it possible for this to happen. Without our volunteers we would be unable to function as over 90% of the work we do is carried out by volunteers. Our ability to provide help in the community relies on many hours of volunteer time, for example, approximately 5000 volunteer hours in donated in 2012 for Loaves and Fishes and Fullstop projects alone. In our shops, we rely on hundreds of volunteer hours every week. All our charitable operations are funded by income from our shops, and donations, and operate due to the incredible dedication of our volunteers. We always need new volunteers in all of our shops. Do you enjoy chatting to people and offering them a great, friendly experience? Are you looking to learn new skills, to help you get work in the retail sector? Do you enjoy sorting and organising? Have you a creative flair for window displays. If any of these apply to you we would love to hear from you. To volunteer at any of our shops contact them directly - see our shop page for contact information. 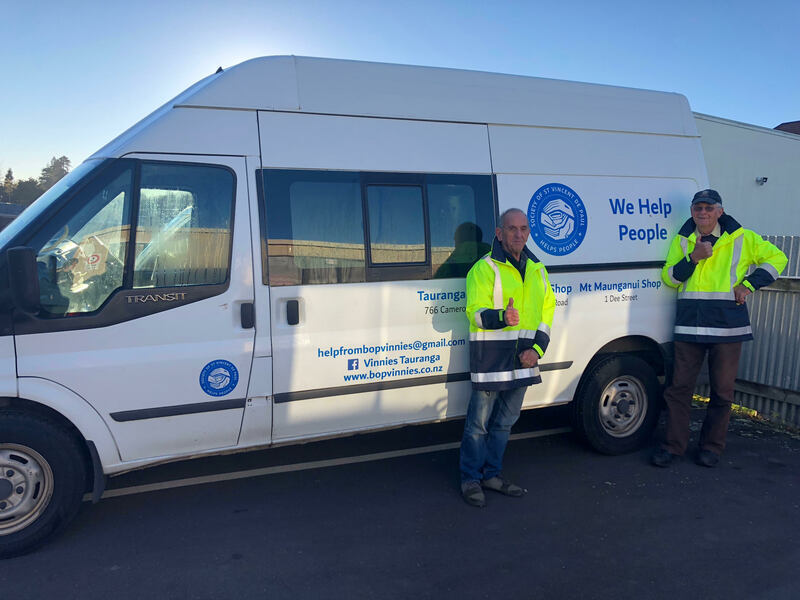 We also require strong willing hands to help with pickups and deliveries, both for our shops and our support centre (as we donate some goods directly to those in need). If you have handy person skills we would be absolutely delighted to hear from you. Operates 6 nights a week going to a different area every evening distributing sandwiches, milo, juice and fruit during the summer months and soup and bread during the winter months, and puts caring into the community. If you are interested in helping Fullstop please contact Meari on fullstop@xtra.co.nz or phone 548 0398. Distributes to the Tauranga schools providing lunches to children in school, who would otherwise go without a mid-day meal. We provide a savoury and sweet sandwich, a snack and a piece of fruit in each of the lunches. The volunteers meet up early on a daily basis to prepare the packed lunches. If you wish to help with Loaves n Fishes please contact Meari on fullstop@xtra.co.nz or phone 548 0398. If you are interested in becoming a conference member, or to volunteer to work directly with the conferences providing our visiting and support services, you would be most welcome. You can enquire through the churches listed on the local groups page, or alternatively use the contact details below. Our local conference volunteers are the core of our community work, and they desperately require new volunteers to assist them in their work.